In the Grand Foyer, you find yourself in a forest of frosted birch trees. The hallway and foyer are graced with elegant silver garlands reflecting a glistening Winter Wonderland. Adorning the pilasters are pendants of gold magnolia leaves and silver branches. Look to the ceiling of the Grand Foyer and you will see the traditional needlepoint "kissing ball," designed and created by Washington, D.C., master needlepoint artist Hyla Hurley and her associates. Santa is dressed in a winter white robe amidst woodland animals, with two polar bears guiding him on his journey to the North Pole. 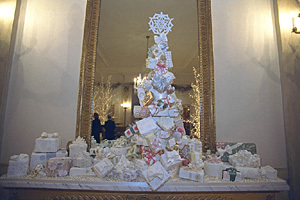 Completing the holiday decorations in the Grand Foyer is the pier table with a Christmas tree comprised of Colette Peters's edible, festive and colorful holiday packages.